Eating is one of Singaporeans’ favourite past times that sometimes we prefer to remain in our comfort zone. For example, most of us will tend to patronise eating places within our neighbourhood and hardly venture out. This leaves many other potentially worthy foodie haunts unexplored. Yishun is one such place where good food can be found at almost every nook and cranny. From scrumptious Chinese cuisines to good old ice-creams, we went on a gastronomic adventure and explored Yishun by foot recently to check out the “die-die-must-try” places, as they put it. This has got to be Yishun’s most famous eatery as this is the first name that frequently pops out among residents during our recent visit. Located within walking distance from Yishun MRT station at Block 928 Yishun Central 1, the stall is usually well-patronised ad evidenced by the long snaking queues. That’s just the tip of the ice-berg though as the lines tend to get extra crazy during lunch and dinner hours. Part of 928 Yishun Laksa’s lure lies in its affordably priced laksa sold at $3 combined with its simple yet earthy ingredients. The bowl is chocked full of ingredients with chopped bee hoon, tau pok, crabsticks, bean sprouts, cockles and a half-boiled egg. Locals swear by its soup that they claim has had them craving for more. We decided to put this to test. The soup has a strong taste of coconut milk while remaining flavourful and slightly sweet. Our verdict: “Win liao”. This stall takes chicken rice to a whole new level with its tender steamed boneless chicken which has become a sort of comfort food among residents here. Still going on strong for more than 20 years, Yishunites have been flocking to this one and only stall for their weekly (some even daily) chicken rice fix and its signature dishes. This, combined with the owner’s congeniality (she allowed us to take multiple shots until we got it right), appear to be its secret recipe in its business longevity. Our recent visit concurs with what the locals are saying as not many chicken rice stalls we had patronised were able to cook their steamed chicken to perfection like this one does. For example, the juicy and tender meats are soaked over a layer of soy sauce that is succulent yet neither too salty nor too sweet. This, combined with its fragrant rice and hearty soup, has kept Singaporeans far and wide to check out what the fuss is all about. Our only gripe? We wished the soup was served piping hot. The stall is located within a walking distance from Yishun MRT station and 928 Laksa at the multi-storey carpark. ikan bilisChong Pang Nasi Lemak needs no introduction and has become one of the favourite-to-go-to destination for supper after a night of clubbing. Established since 1973, this stall is noted for its fragrant and light rice, signature chicken wings, sambal and tangy nasi lemak. This has made the here legendary that no one else can rival. While the nasi lemak is tasty, its location is a bit out of the way for those who do not drive. For those who do, there are very few parking spaces as is located just by the roadside. While its location and parking may not be so ideal, this enduring food icon is still worth visiting, especially since it closes as late as 7am in the morning. This gives you plenty of opportunity to stake out the place during off-peak hours. Good luck! ‘Economical’ does not neccessarily have to translate to bland food. Take it from this stall that is noted for having “the best economical bee hoon”. Coupled with its savoury and tender, fried to perfection chicken wings, the stall has developed a cult following, especially among workers, NSFs and students who love their signature fried bee hoon sufficiently greased but not too oily. You can also enjoy additional top-ups of their fried chicken wings and otah-otah! The stall is hard to miss as you will be greeted by a snaking queue when you take the bus past Chong Pang City. Although located on the quieter part of Yishun, the wanton noodle here is in such high demand that by 10am the stall will call it a day. Priced at only $2.50, the stall serves a generous portion of noodles, char siew, vegetables and three wantons. Adding to the kick are the pieces of chestnuts in the wanton which provide a crunchy after taste. A word of advice: Come early to avoid disappointments. Ask any millenials in Yishun and many would never have thought Arnold’s is a homegrown brand. This fast food restaurant began its humble beginnings from a corner shop located on the second floor of City Plaza and still continues to maintain its presence there for three decades. Arnold’s is a pioneer in many ways as it had helped to fill demand for halal fried chicken for the Muslim market. This was considered something bold for its era, especially when it is competing with other more established global brands amid a small market. Relying on its oh-so-crispy fried chicken, this fast-food restaurant has since then expanded to three outlets, including this one at Yishun 10. Famed for its fresh, succulent and well-marinated chicken, Arnold’s now draws a very diverse crowd. This was clearly evident during our recent visit whereby the many different races from all walks of life were spotted here. We ordered a two-piece chicken meal comprising fries, coleslaw and a bandung drink which costs around $7.30. The chicken still maintains its flavour. Our only gripe is they do not give you the option to choose your favourite chicken parts. Still, this fast-food outlet is worth visiting. We would recommend going during the weekdays after the lunch time crowd has left. The queue here can get pretty long, especially during the weekend and public holidays. This is another Singaporean halal fast-food joint but where you can customise your own burgers! When it first opened its door in 2014, the restaurant received rave reviews on social media for its DIY concept where you can combine the char-grilled patties with a wide variety of sides. We decided to go for something traditional during our recent visit by ordering its Classic Beef Burger with fries and sprite. However, we found the taste rather bland. This is despite our attempt to bring out its flavour by adding in a dollop of chili sauce. Still, its mix-and-match concept will endear to those who prefer your own bespoke burgers. We were pleasantly suprised to see a long queue at this famous dessert stall despite it being a weekday non-peak hour. Located right next door to 928 Yishun Laksa, this is where Singaporeans from far and wide will usually end up to fulfill their sweet cravings, especially after a piping hot bowl of laksa. The crowd here is extremely varied ranging from nurses working at the nearby Khoo Teck Puat Hospital to the uncle sitting next to us residing in Punggol. Be it a hot, cold, sweet, or sour, the stall offers a wide offering of desserts to suit your tastebuds. One of its signature dessert is chendol. Served in a plastic container with ice shavings, coconut milk, it is then mixed with attap seed, green jelly, grass jelly and red beans before topping it off with condensed milk. Decently sized, you can easily polish this off after a hearty meal. Opening hours: From 11.30am to 10pm (Tuesdays to Thursdays) and 11.30am to 11pm (Fridays and Saturdays). Closed on Mondays. If you like your ice-cream the good-fashion way (and by that, we mean freshly made ice-cream and sorbets), then Holy Cow Creamery is your saviour. With a tagline that promises “Yummy. Refreshing. Happiness," this ice-cream parlour is the first of its kind to ever set foot in Yishun. 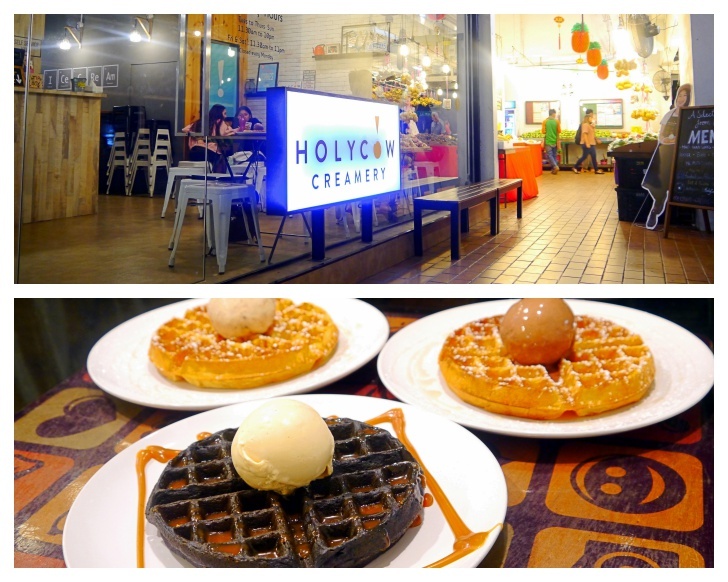 Despite being located in Yishun, the café is almost always packed as many swear by their soft and fluffy ice-cream waffles, judging by online reviews. Doughwory Bakery is a pastry cafe that is ideal for those wanting to have your cake and eat it too. (Read: Having your fancy sweet treats to go along with an Instagram-worthy post). Offering a wide selection of delectable sweet treats and confectioneries, this bakery is heaven for those in need of your sugar rush. The first thing that captures our attention during our recent visit here is the delectable display of pies, puff pastries, cakes, waffles and more, that we almost ordered everything on the menu. Ultimately, we decided to go for something more conservative and narrowed it down to its croissant, curry puff and lemon cheese tart. Reasonably priced at $3 each, they do go very well with steaming cup of latte. A word of caution though - the bakery does not have many available tables. As such, you must be prepared to wait, come during off-peak hours or order them as your takeaway treats.